Commedia dell'Arte (Italian: "The art of comedy") is a form of improvisational theater that began in Italy in the sixteenth century, remained highly popular through the eighteenth century, and is performed ongoing. From its earliest times, performances are unscripted, held outside, and employ few props. While there is no admission fee to watch the performances, the performers are routinely supported by donations from the audience. Characters are identified by the costumes, masks, and props they used. The early characters included the forebears of the modern clown, namely Harlequin (English for arlecchino) and Zanni. Commedia dell'arte appeal to the masses, without regard for language, nationality, or social status. In a similar way, universal forms of entertainment have continued to be popular through the ages, including the Marx brothers comedies and television shows such as The Simpsons. Thus, commedia dell'arte displays the universal creativity and intelligence of humankind. Commedia dell'arte has a long history originating in the streets and market places of the early Italian Renaissance, though its roots can be traced even further back, as far as the Ancient Greek and Roman theater. The Italian street performers wore masks with exaggerated comic features. They draw further attention to themselves with physical and acrobatic techniques. These actors formed into traveling troupes, some of which had portable stages that they took from city to city. These companies typically included about ten actors—seven men and three women. By contrast, many other forms of theater at the time excluded women completely. These actors worked without scripts, following only written scenarios which outlined the action. They would then tailor the show to the particular audience of the region where they were performing. The commedia dell'arte in Italy was firmly established as a distinct genre by the mid-1500s, with the height of its popularity extending from about 1550 to 1750. In later years, the tradition spread to other parts of Europe, taking on a significant French influence. Players made their performances accessible to all social classes, removing language as a barrier through the use of skillful mime techniques, universally understandable characters, traditional gags and pranks, identifiable masks, broad physical comedy and improvised dialogue that was tailored to each audience. After it gained popularity in France, the influence of commedia dell'arte was felt on plays performed in other sectors of the French theater, most notably in the work of Moliere and his comedy, Tartuffe, which included many commedia scenarios. Stock commedia characters appearing in Tartuffe have also been adopted in dramatic works in other countries, all the way up to the present. 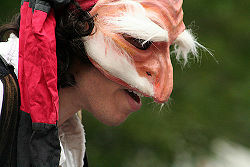 A modern performance of a commedia dell'arte maintains the tradition of limited costumes. Commedia dell'arte performances were a unique combination of set and impromptu elements. The general outline, the characters and their relationships, as well as the outcome of the situation were all decided before the performance began, using stock characters and tried and true plots. Each performance began with a prologue and was divided into several acts. The actors were required to employ their considerable talents in filling out the remaining details of the story and keep the attention of the audience. This required commedia dell'arte performers to be skilled at smooth banter, surprise, clarity, and wit. The actors chose their words carefully to produce the desired effect—making the audience laugh or cry—and their lines flowed in a rhythm as steady and precise as swordplay. The best of them imbued their roles with individuality, freshness, and brilliance, lending value to the productions which, in and of themselves, had little worth. Many of the basic plot elements in commedia dell'arte can be traced back to the Roman comedies of Plautus (c. 254–184 B.C.E.) and playwright Terence (d. 159 B.C.E. ), some of which were in turn translations of earlier lost Greek comedies from the fourth century B.C.E. These plots focused mainly around love intrigues or clever tricks to procure money or outwit a simpleton, focusing on themes of adultery, jealousy, old age, and young love. That said, there was considerable diversity of incidents, such as night scenes, stories in which the hero is mistaken for the villain, cases where father and son fall in love with the same girl, and so on. One very classic, traditional plot is that the young lovers, innamorati, are in love and wish to be married, but one elder (vecchio) or several elders (vecchi) are stopping this from happening, leading the lovers to ask one or more zanni (eccentric servants) for help. Typically the story ends happily, with the marriage of the innamorati and forgiveness for any wrongdoings. 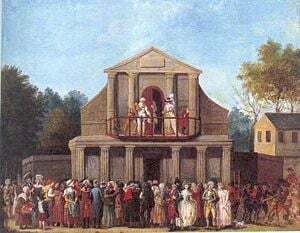 There are countless variations on this story, as well as many that diverge wholly from the structure, such as a well-known story about Arlecchino becoming mysteriously pregnant, or the Punch and Judy scenario. In addition to the plot, an important part of every play were the humorous interludes, called lazzi, often having little to do with the plot, and typically given to the most expert and popular actors. These comic performers, sometimes the characters of Lazzi and Concetti, made use of well-rehearsed jokes as well as on-the-spot improvised and interpolated episodes and routines, called burle (singular burla, Italian for joke), usually involving a practical joke. Since the productions were improvised, dialogue and action could easily be changed to satirize local scandals, current events, or regional tastes, while still using old jokes and punch lines. The interludes also make us of clever pantomimic acting, acrobatic feats, juggling, or wrestling. 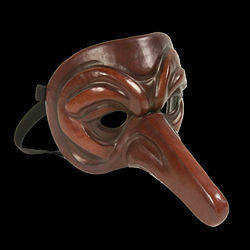 A mask used in a commedia dell'arte. Characters were identified by their costumes, masks, and even characteristic props, such as a type of baton known as a slapstick. In general the characters could be categorized under four or five groups: Pantalone and the Doctor, both old men; the Captain, a young man of adventure; the valet or jester, usually called Zanni; the hunchback Punchinello; and another old man, somewhat different from the first two. 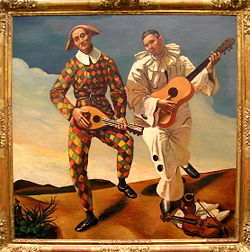 Some of the characters, namely Harlequin (English for arlecchino) and Zanni were forebears of the modern clown. Once an actor chose a character, he would usually play that character for the rest of his career. Arlecchino—also known as Harlequin. Arlecchino is a clown. Typically acrobatic and mischievous, he is one of the zanni. He is a servant, and is recognizable by the colorful diamond-shaped patches that traditionally were part of his costume. The part is sometimes substituted with Truffaldino, his son. His mask has a low forehead with a wart, and sometimes wore a black stocking wound round the lower face and then up over the head. Arlecchino is often the servant to Pantalone, or sometimes to Il Dottore. He is in love with Colombina, but she only makes fun of him. He can often have a close relationship with the audience, involving them in the action or gesturing to them. Il Capitano—a young man, swash-buckling and bold, but not necessarily heroic. Il Capitano generally wears the military dress of the period he is acting. His attire is generally foppish and overdone. Il Capitano is usually played as a braggart, a ladies man, and a cavalier. Colombina—developed out of Arlecchino, she is his female counterpart. Usually portrayed as clever, crafty, and untamed. She is also a servant and a member of the zanni, and quite often she compels the action. She sometimes is played wearing colored patches in Arlecchino's style. Il Dottore—the doctor, is one of the vecchi, or old men. He is seen as a learned man, but generally that impression is false. Wealthy, he is often played as pedantic, miserly, and hopelessly unsuccessful with women. He usually talks constantly about a topic, in an attempt to impress anyone who is around. Everyone else in the scene will believe what he is saying is true, but most of the time it is all made up, and this often lands everyone in more trouble and confusion. The Innamorati are the young lovers. The innamorato and innamorata had many different names over time ("Isabella" was a particularly popular name for the woman, as was "Flavio" for the man). They are young, righteous, and hopelessly in love with one another. They wear the most fashionable dress of the period they are acting, and, unlike the other characters, do not wear masks. Often seen singing, dancing, or reciting poetry, they are usually played as the children of Dottore and Pantalone depending on the situation they are in. They are madly in love but never seem able to get together. A modern portrayal of the character of Pantalone. Pantalone—a member of the vecchi. Usually quite wealthy, and very greedy. He is the archetypal "old miser." He cares about nothing so much as money, and will do anything in order to get it. His costume includes red pants, and often a long beard. Pedrolino—the loyal servant, also known as "Pierrot" or "Pedro." He is hard, trustworthy, honest, and in every way devoted to his master. He is also charming and likable, and is portrayed wearing a loose white outfit with a neck ruff. Pulcinella—sometimes called "Punch," he is portrayed as pitiable, helpless, and often physically disfigured. He usually has a hump, a distinct limp, or some other obvious physical deformity. In some portrayals he cannot speak, and expresses himself in squeaks or other strange sounds. His personality can be foolish or sly and shrewd. 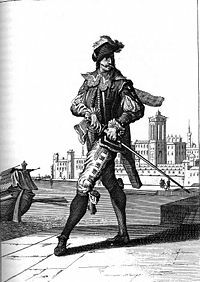 Scaramuccia—also known as Scaramouche, he is a roguish character who wears a black velvet mask and black trousers, shirt and hat. He is usually portrayed as a buffoon or boastful coward. Tartaglia—short sighted and with a terrible stutter, he is usually classed as one of the group of old characters who appears in many scenarios as one of the lovers. His social status varies; he is sometimes a bailiff, lawyer, notary or chemist. Dramatist Carlo Gozzi portrayed Tartaglia as a statesman, and so he remained thereafter. Tartaglia wears a large felt hat, an enormous cloak, oversized boots, a long sword, a giant mustache and a cardboard nose. During its hundreds of years of popularity in Europe, Commedia dell'arte became the inspiration for many ballets, from Petipa's Les Millions de Harlequin (1900), to Fokine's Carnaval (1910), Massine's Pulcinella (1920), and Glen Tetley's Pierrot lunaire (1962). More recently, commedia dell'arte's influence can be seen in the Marx Brothers movies, where much of the action and dialogue was improvised, surrounding a predetermined plot. Its influences can also be seen in the popular cartoon, The Simpsons, where Homer, Bart, and Mr. Burns are all examples of commedia dell'arte characters. A modern portrayal of the character of Colombina. A modern performance of Commedia dell'arte on a stage in Venice. ↑ 1.0 1.1 The Commedia dell'arte Homepage, A Brief History. Retrieved January 28, 2009. ↑ 2.0 2.1 American University, Commedia dell'arte History. Retrieved January 28, 2009. ↑ 3.0 3.1 3.2 3.3 Theater History, Commedia dell'arte. Retrieved January 28, 2009. ↑ Commedia dell'arte. About.com. Retrieved January 28, 2009.
International School of Physical Theater. Internet Shakespeare on Commedia dell'arte. This page was last modified on 14 March 2017, at 17:57.